Tree Top Trek Manchester is a high rope course based in Heaton Park, Manchester. It is similar to Go Ape but does have some differences, the main one being that as well as the tree top trek they also have tree top nets that look amazing, think trampolines in the trees and you will have a better idea what I mean. 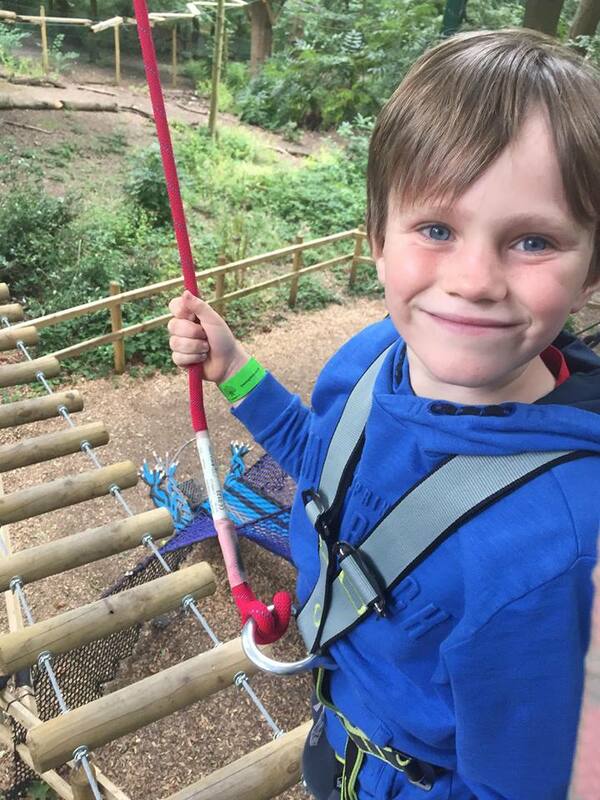 We booked on the Tree Top Trek junior which is available for children from the age of 5 and costs £18 per person. This course starts at 5 meters high and therefore is a lower treetop adventure than the adults one, it features 16 fun challenges, including 3 zip lines and despite it being “only” 5 meters from the ground it still feels incredibly high at times, especially when you are balancing on a bean or climbing over a moving obstacle. As soon as the boys knew what we were doing they were ridiculously excited, I have spoken many a time about their love for adventure and their ability to climb and how they spend more time up trees than on the floor so this is the perfect activity and challenge for them. 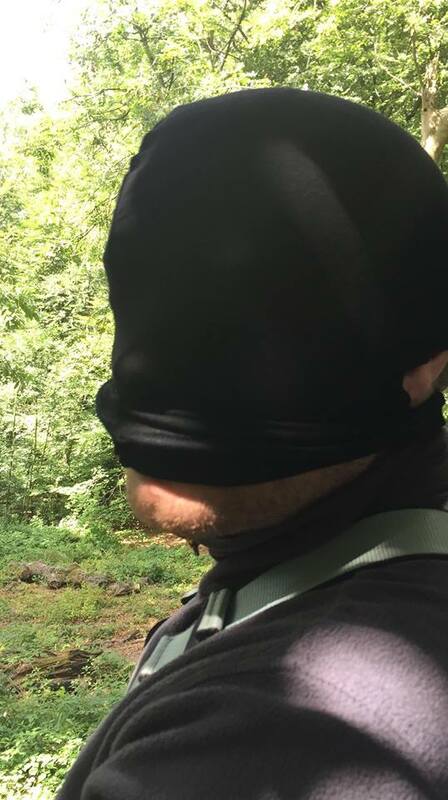 That being said their recent visit to Go Ape did give them a confidence boost and they took to Tree Top Trek Manchester with such ease and speed that even the instructor was impressed and as they finished well within the hour, we were given the chance to go round again…..only this time wearing blindfolds. At first I thought she was joking but nope she really did want two of us to wear blind folds whilst the other two lead them round the course. We decided that the tiddler could lead daddy round and I would lead the big’un round, oh how we laughed if you get the chance to try this you must. At first everyone was being so serious and careful and then all of a sudden the tiddler told daddy to take a big step off the platform and onto a beam, only for there to be no beam as it was in fact the zip wire. He was so pleased with himself that I thought we would all fall out of the trees with laughter and poor daddy was just whizzing through the trees half laughing half screaming from shock, I’m not sure he really trusted him again after that. 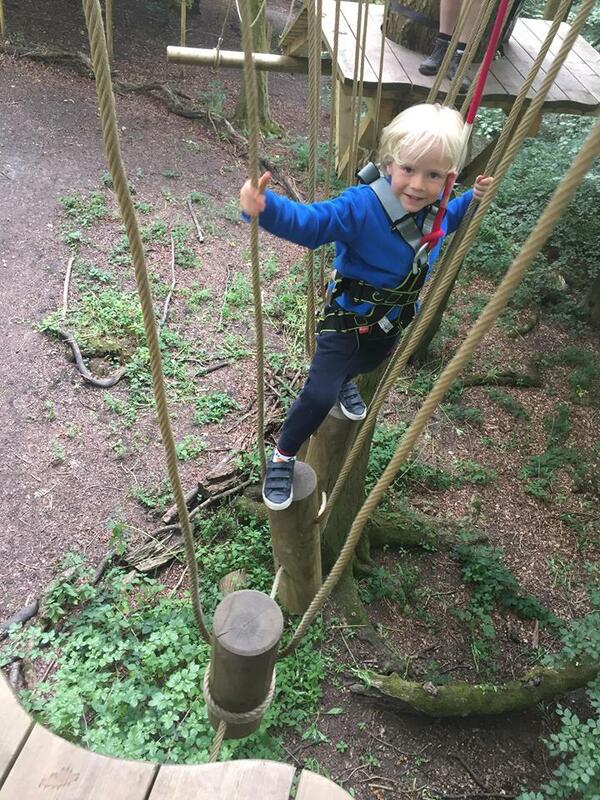 The Tree Top trek Manchester course is relatively straight forward and as the harnesses can be lengthened and shortened at any point on the course it really is adaptable for the little ones, making this the perfect beginners tree top course for every child (and adult). The instructors that we met on the day were all so happy and friendly, especially the lady who took us round who had so much patience with us, especially when my nerves were getting the better of me. I would highly recommend you visit Tree Top Trek Manchester and enjoy the junior course as a family, followed by a picnic in Heaton park itself and a walk round the grounds as they are beautiful and you can really make a day of it. (We were gifted the tickets in exchange for a review, all opinions are my own).